↑ "An Overview of the Central Development Region (CR)" (PDF). Internal-displacement.org. ओरिजनल (PDF) से 2 February 2012 के पुरालेखित. पहुँचतिथी 25 November 2013. ↑ "Kathmandu Metropolitan City Office – Introduction". Kathmandu Metropolitan City Office. ओरिजनल से 23 June 2012 के पुरालेखित. पहुँचतिथी 14 August 2014. ↑ "Kathmandu Facts". Kathmandu Metropolitan City Council, Government of Nepal. पहुँचतिथी 12 दिसंबर 2009. ↑ "Geography". 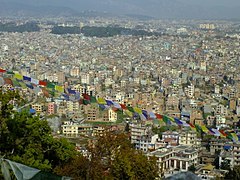 Kathmandu Metropolitan City. पहुँचतिथी 12 दिसंबर 2009. ↑ Shreshta, S.H (2005). Nepal in Maps. 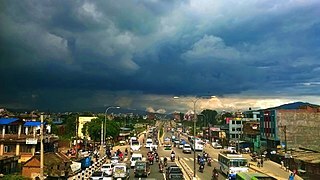 Kathmandu valley. Kathmandu: Educational Publishing House. पप. 102–14.